Here’s an exclusive Q&A with Kiki Taufik, head of the Indonesia Forest campaign, Greenpeace. Well worth a few minutes to read. As you may know, Greenpeace has played a key role in raising awareness of the challenges faced in saving Indonesia’s remaining forests and peatlands. 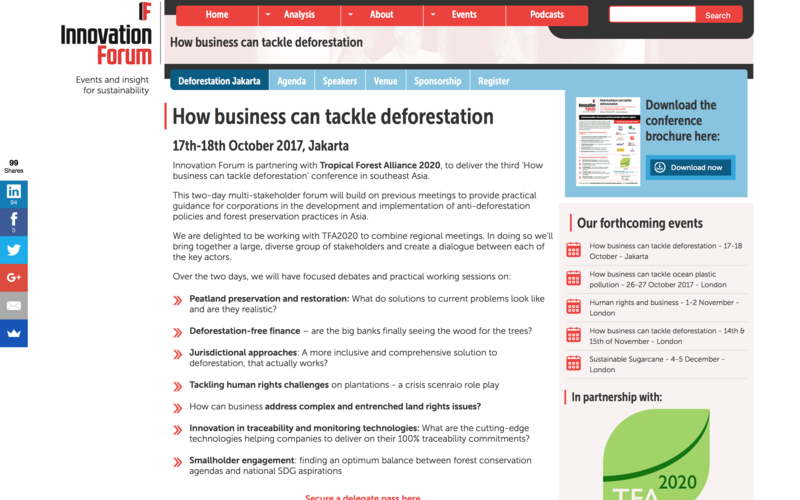 Whilst not all company executives might agree with their methods, all of the time, there’s no denying they are significant actor in Indonesia and world-wide on deforestation and many other issues. Here’s the Q&A below. TW: What’s your mood at the moment Kiki, when it comes to saving forests in Indonesia, positive, negative, or somewhere in between? KT: Greenpeace has been fighting to protect Indonesia’s forests for over a decade. There have been some big wins along the way: most users and traders of palm oil now have ‘no deforestation’ policies. There have also been some technology breakthroughs that allow us to monitor forests and supply chains like never before. But Indonesia’s forests are still being cleared – and often by growers that supply the global market with palm oil. It’s hard to feel positive when these companies are expanding into previously untouched regions, such as Papua. My priority is to turn all of these commitments into action. Two things urgently need to change. Firstly, there needs much greater emphasis on monitoring suppliers – and from all tiers of the supply chain. Many companies, particularly consumer brands, are worryingly complacent when it comes to their third-party suppliers. Secondly, the consequences for companies that destroy rainforests need to start ramping up. Palm oil companies won’t reform until the penalties for clearing rainforests are greater than any profits they stand to gain. TW: I’ve heard Greenpeace campaigners say there are maybe 30-40 companies, alongside smallholders, still doing real damage in Indonesia. Broadly speaking, who are these companies? KT: Now that most of the bigger plantation companies have adopted ‘no deforestation’ policies the nature of the threat Indonesia’s rainforests began to shift. Those companies are far from perfect – outstanding issues include labour and social conflicts, fires and impact on peatland – but right now, the greatest threat to forests is coming from small- and medium-sized plantation companies, or from large multinationals just starting to get into the plantation business. These companies have much smaller landbanks than established players like Golden Agri Resources or Wilmar: often around 50,000 or 100,000 hectares. Some have strong links to powerful figures in the Indonesian and Malaysian governments; others occupy prominent positions in the Roundtable on Sustainable Palm Oil. Some companies, like Goodhope or FELDA, have been supplying the market with palm oil from established plantations in Sumatra and Kalimantan while clearing rainforest elsewhere in Indonesia. Others, like POSCO Daewoo, have cleared thousands of hectares in the past year or so and are just bringing their first few shipments of oil to market. TW: What are their connections with big brand supply chains. Some, like Indofood, have complex relationships with brands, are there many cases like this? KT: In some cases, consumer brands have set up a joint venture with a company they shouldn’t be doing any business with at all. Indofood is a good example – it has joint ventures with Nestle, PepsiCo and Wilmar. But the more common scenario involves brands being supplied with palm oil produced by third-party suppliers that breach their ‘no deforestation’ policies. It works like this: Brand X is buying palm oil from a trader with an No Deforestation, No Peat, No Exploitation (NDPE) policy. The trader has purchased some of its oil from a mill in Sumatra. That mill is owned by a palm oil company clearing in Papua. That’s a huge reputational risk – yet most brands aren’t looking out for it. Too many companies are only looking at the mills in their supply chains instead of asking whether their palm oil come from companies that are destroying rainforests. TW: We also hear campaigners say that there’s big gap between 450+ companies having policies around prevent deforestation, and actual implementation of these in the ground. What do companies need to do, to close this gap? KT: Companies need to identify who produces the palm oil they use and make sure those companies meet their NDPE standards. The first step is obtaining credible data on the companies in their supply chain, including mill and concession information. The next step is to use that data to monitor suppliers. Companies should be looking across suppliers’ entire operations, including concessions that are not yet part of the supply chain. Ultimately, ‘no deforestation’ policies will only make a difference once we close the market to growers that don’t stop clearing. Greenpeace is calling for a cut-off date for deforestation – we think any grower that destroyed forests after December 2015 should be cut out of the market, unless they are prepared to restore whatever was destroyed after that deadline. TW: Government…a complex beast anywhere, but particularly in Indonesia. What’s your sense of how serious they are, right now, in prevention, protection and restoration of forest land? KT: After the 2015 fire crisis, President Jokowi made high-profile commitments to take action on companies that developed peatlands. He also just extended the moratorium on new concessions on peatland or primary forest. The President’s intentions seem good, but there has been very mixed follow up. Our field research shows the plantation sector is still not changing its practices and gets away with it because of poor governance. The Indonesian government is not monolithic. We have district, regional and national government, and lots of different ministries. Some of the most critical decisions, such as allocating new concessions for plantation development are taken at district level with very little oversight. This is one reason why transparency is so vital to the sector: we need to know who controls land and how they got hold of it. Yet despite signing up to good governance commitments, such as the Open Government Partnership, national government has resisted civil society efforts to improve governance in the forestry sector by making concession data public. TW: We hear about a political backlash against deforestation prevention and even restoration all the time. Where does this come from? How significant is it? KT: Unfortunately, lots of powerful people stand to benefit from forest destruction, and we’re seeing concerted backlash against environmentalists around the world. 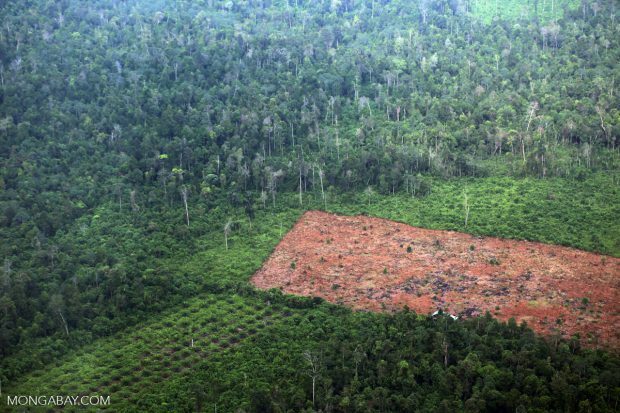 Here in Indonesia, a prime case is the downfall of the Indonesian Palm Oil Pledge (IPOP). IPOP was a forum for companies to lobby government to improve forest governance and support a sustainable palm oil industry. But it came under pressure from parts of the Ministry of Agriculture and other government departments. The Office of the Coordinating Economic Minister even accused IPOP members of undermining the reputation of Indonesia’s palm oil industry. IPOP was finally forced to disband last year. Of course, Indonesia’s reputational problems didn’t go away. If anything, the whole saga just reinforced the message that the palm oil industry and some parts of the Indonesian government aren’t ready to operate sustainably. This helps explain why there has been concerted effort from the European Union to restrict the trade in deforestation commodities. TW: Banks and finance. Where are the big international banks, in your view, in this debate? And are domestic banks likely to fill any finance gaps left by big global banks taking deforestation seriously? KT: The stance of the big banks on palm oil varies widely. Some European banks, such as HSBC and ABN Amro, have comparatively strong policies – these commit them to refuse funding to palm oil companies that cause deforestation, peatland clearance, or human rights abuses. However, the banking sector as a whole lags far behind other parts of the palm oil industry in terms of the standards they set, and many banks – particularly Asian banks – have no published policies at all. We need strong standards to be set across the banking sector so that companies destroying forests or ignoring human rights will find it impossible to raise capital. TW: You are speaking at our upcoming conference, held with TFA 2020, in Jakarta, on all this. What would you like to see come out of the conference? KT: I would like the governments and corporations attending this conference to make a public commitment to open up the industry ‘black box’. The right to access accurate information is critical for informed decision-making, to monitor public actions and for holding companies to account. From the government side, delivering on the promised One Map initiative would be a good first step. Companies can play their part by requiring their third-party suppliers to publish concession maps. Many traders have now published detailed lists of the mills in their supply chains – this is a welcome step and consumer brands should do likewise. This isn’t just about about rainforests. Access to accurate maps would help identify those responsible for forest fires. It would help communities defend themselves from land-grabbing. Credible land use data is key to stamping out corruption and makes it harder for companies to evade taxes. With so much to gain, what is stopping us?